Samford University's music calendar is swiftly, sadly, running out. Next week brings us the season’s final performances of Bells of Buchanan and Percussion Ensemble. Patty McDonald will sponsor the Bells of Buchanan handbell concert April 16 at 7:30 p.m. in Brock Recital Hall. 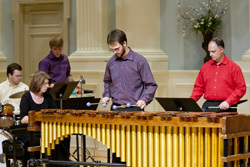 Our Percussion Ensemble will offer its last performance of the season April 18 at 7:30 p.m. in Brock Recital Hall. Don’t forget that the Samford Art Student Annual Juried Show in Samford Gallery continues through April 26. You’re welcome to view the work any weekday 9 a.m.-4:30 p.m., but we also hope you’ll join us for the reception and award ceremony 4-6 p.m. April 25. Our theatre and dance students had great experiences, to say the least, at the Southeastern Theatre Conference (SETC) in Louisville, Ky. March 6-10. Have a look at the results! It’s always nice to see others recognizing the talent of our students and the quality of our programs. This semester holds a few more opportunities left to enjoy both. Stay tuned!